To honor the passing of Jim Rohn on December 5th, 2009, I will be sharing some of my favorite quotes throughout the week. Jim Rohn was a powerful influence in my thinking beginning with my introduction to his teaching in early 1981. See more about Jim Rohn at www.jimrohn.com. the poor spend their money and invest what's left." and turn investment into financial independence." "I used to say, "Things cost too much." "The problem isn't that things cost too much. The problem is that you can't afford it." that the problem wasn't it--the problem was me! How many times I have heard excellent advice about money and finances and have decided to do as I had done so many times before. Somehow, I would think that it would all work out and that I could get to the point where I could start properly and make a go of it when I had enough to start or the perfect right time. That day never came. No surprise to most of you probably, but many people I know were in the same poor thinking that I had accepted. Jim Rohn suggested that the first 30% of your income should be allocated like this: 10% for investment, 10% to give away, and 10% for savings, then the rest could go to take care of living expenses and desires. I used to think that the way to do that was to start over and do it right from that point. A total fantasy. There is only one way: to start from where I am now and do it. If I wait for things to change, I will be waiting all my life. Jim's ideas about money and investments is backed up thoroughly by hundreds of successful people. I've read many of them and have seen similar concepts. Most of them include 10% as a give away, whether it is tithing to a church, or giving to a favorite charity, or giving it directly to people in need. The grand idea is gratitude. It is a way of expressing abundance and gratitude at the same time. In effect, we are saying that we have plenty to give this away. Today is the last day of 2009 and many will be writing out resolutions for the new year like losing weight, getting control of finances, getting a better position, etc. It's a great time to make a change we think. Out with the old and in with the new. Wipe the slate clean and start again. The beginning of a new year sounds so like a wonderful place to start fresh. You know what? Today is Thursday and tomorrow is Friday. That's it. Just another day. . . unless. . . we really are serious and follow through. Don't I know this! How many times have I thought a day or a time frame would make a difference. There is only now. Whether it is Jim Rohn's ideas or another wise person, we can take that wonderful advice and make the change anytime we decide. Maybe it is me. Maybe it is now. Spread Some Joy Today--Feel as if you've made the major change you've wanted to make for so long. Feel as if it has been in place and the change has been made. Other people will see your new confidence. It is unmistakable! "Pity the man who inherits a million dollars and isn't a millionaire. Here's what would be pitiful, if your income grew and you didn't." you will always have what you've got." and can't change, like your fingerprints. and must take responsibility for forming." You've read about it and maybe seen some examples on television where someone won a huge lottery and within a short time, they were broke. "Pity the man who inherits a million dollars and isn't a millionaire. Many of us have always thought it was about money, but it isn't really. I've also heard the thought that if the country's wealth was gathered and divided equally, it would be back in the same places in a very short period of time. Again, because it is the thinking, not the money that creates the accumulation or the spending. Personal development is too soft a phrase to use here. A better one is growing as a person as in expansion, enlightenment and character building. Jim used to like to say, "watch what you become in pursuit of what you want." Or he might say, "It's not becoming a millionaire that matters as much as what you become in order to get the million." It was expressed sort of as a warning but really was an encouragement. I've been in sales management in one capacity or another for about 35 years and I've seen a lot of people who wanted to be the sales manager--to be in charge. Almost none of them would do what it took to get there. Those that got there without the willingness to become what you must become to do well as a sales manager, were obviously poor at it. I found as Jim said that it is more important what I became as a result of the job. You've probably heard the three bricklayer story. One is laying one brick on top of the other with mortar in between. The other is building a wall so long and so high. The last is building a school where children will learn and play. You could use the word attitude. That word has taken a beating over the last 20 years or so, but it is true. Attitude is so important because it makes such a difference in what you become in pursuit of what you want. Of course, the way of all of this is that in order to change, we have to change. Seems like such an obvious thing, but how hard it is to get to that final decision point and then move beyond it to the actual change. The really good news is that we all can do it and have the power. All we really need is the desire. It seems like I have always been in a state of becoming. I have grown to love that state. It is a powerful thing to become, don't you think? We'll just keep going down the path of becoming together. I have realized as you may have that it is not a destination, but a journey. There's actually a lot of peace and comfort in that. I hope you feel that as well. I'm On A Journey Of Becoming! Spread Some Joy Today--Pretend that you have a million dollars in the bank today. Feel as you would feel. Is there a smile permanently etched into your face? A joy welling up inside? Or just a calm, confidence that others can feel? Share it. "Life is part positive and part negative. Suppose you went to hear a symphony orchestra and all they played were the little, happy, high notes? Would you leave soon? Let me hear the rumble of the bass, the crash of the cymbals, and the minor keys." I love this quote about the positive and the negative and using the orchestra to make the point that both are necessary and desired. Many people call me Mr. Positive or some other less endearing names, and it might seem like a dichotomy to accept the idea of the negative mixing with the positive being a good thing. I absolutely focus on the positive whenever I can, yet what would positive be without the negative? What would solutions be without problems? What would success be without failure? I don't think it is possible to be one and completely exclude the other. I think excluding one would automatically exclude the other, then there would be nothing. The deal is, where do I focus my attention? I focus on uplifting and exciting! I am well aware of downgrading and boring. I have no use for them except as a contrast to what I desire. Yet, without them, what would uplifting and exciting mean? It would mean nothing. If I were to focus my attention on downgrading and boring, I would achieve a different result. I suppose a good question then is which would you choose? How would you like to feel? Choosing to focus on one is not excluding the other, but acknowledging it. Now, here's what I really get from this quote: My goal is to be neutral, centered. Think of it like stereophonic music where you hear different parts through the right and the left, yet you are centered and can experience them both and reap the rewards of the combination. I absolutely love music to the degree that I can become absolutely lost in it as I experience the different sounds. I can totally appreciate them together while at the same time hearing them as separate. I love a good sad song once in a while, but I find that happy, uplifting, powerfully expressed, moving beat music is my preference. The main reason is how I feel when I hear it. Or, better said, how I want to feel. How do you want to feel? Choose your focus. Don't exclude anything, but choose your focus and then you get to feel how you want to feel. Isn't it so awesome that you get to choose all of that? So powerfully enabling! I Love Music! I Love Joy! I Appreciate All! Spread Some Joy Today--You know, there is just no better way to show how you feel than a smile from knowing you are loved so deeply that it is the love of God. Smile that way today for others to see. It is incredibly powerful and yet so simple. To honor the passing of Jim Rohn on December 5th, 2009, I will be sharing some of my favorite quotes throughout the week. Jim Rohn was a powerful influence in my thinking beginning with my introduction to his teaching in early 1981. See more about Jim Rohn at http://rs6.net/tn.jsp?t=ikjbgfdab.0.0.jddxifcab.0&p=http://www.jimrohn.com/&id=preview. "Don't let the learning from your own experiences take too long. I would suggest that's long enough!" he doesn't need motivation to speed him up. What he needs is education to turn him around." "Learning is the beginning of wealth. Searching and learning is where the miracle process all begins." has already been written. And guess what? It's all available." There was a time when I couldn't wait to get out of school. Now, I can't wait to learn something new. One was a requirement and the other a choice. What kind of education does one get when it is a requirement? What kind does one get when it is a choice? Learning from your own experiences is one way to go about living. Another, more efficient way is to at least add other people's experiences to the mix. A really fast way is to learn from other people's experience. Why make all the mistakes yourself just to learn when you can see all the mistakes others have made and how they fixed it? And getting several different perspectives might be a good way to go about it. There are so many people who have written about their mistakes and successes. There is so much to learn from them in order to avoid having to learn from the School of Hard Knocks. Jim Rohn taught me much about learning and what is even better is that he taught me the desire to learn. He made it sound so delightful. He was such an encourager of reading and learning. He was a master of journaling, recording lessons learned, ideas found, inspirations received, and wisdom gained. The way he talked about this created within me more of a desire to learn. What is more is that he taught me to learn more about philosophy. He's been called "America's Foremost Business Philosopher." Why was even more intriguing to him than what. He would ask his audience, "what is it that makes the difference from being average to fortunate? I don't know. . ." Then, he would make some suggestions for you to consider. Not edicts, but suggestions. He always left it open enough to let you come in and look for yourself and then make up your own mind. His audiences brought notebooks and took copious notes. The audience (even several hundred at a time) would be so quiet as he spoke his bits of wisdom because they were absorbing the thought and writing it in their notebook for review later. He was absolutely a great teacher, and yet, he was a friend and mentor to them as Earl Shoaff was a mentor to him, and he was quick to give the credit to his mentor. It is the desire to learn through Jim's masterful philosophical talks that caught me and encouraged me. Every day is a new day to choose more wisely and Jim has given me the wisdom. I have taken the notes. I need to review them periodically to see where I am in the process. I am so blessed to have accepted Jim's challenges. There is always today to get back on track and do it well this time. I will rise to the occasion! Learning Is So Exciting! I Can't Wait For What's Next! Spread Some Joy Today--Spread the joy of learning! Share your enthusiasm! Realize the joy that your enthusiasm creates in others. It is truly contagious. "Don't wish it was easier; wish you were better. Don't wish for less problems; wish for more skills. Don't wish for less challenges; wish for more wisdom. You must either modify your dreams or magnify your skills." "Don't say, "If I could, I would." Say instead, "If I can, I will." "Don't join an easy crowd. You won't grow. Go where the expectations and the demands to perform are high." Isn't it so easy to focus on the problems, what is wrong, to want to know why it is not working out and to long for a time when these do not exist. I've been there and have thought that as well. Trouble is, it doesn't help, does it? Nothing changes. All I saw was more problems, more challenges and more frustration. It reminds me of John Mayer's very popular song, Waiting On the World To Change. Jim Rohn knows a better way: magnify your skills and become the best you can be. Hanging around the easy crowd is nice, but it is a pleasant passtime at best. Better to hang around people who challenge you to think, to do, to improve, to be creative, to excel. These people will be so influential in your life--and so much more fun. Jim Rohn taught me to develop my own philosophy. I accepted that challenge in 1981 and am still in process today. It is a life-long challenge. There is always more to learn. Spread Some Joy Today--Smile as if you enjoy your own company and every moment of the day. People are bound to ask you about why you are so happy. What will you tell them? "You must constantly ask yourself these questions: Who am I around? What are they doing to me? What have they got me reading? What have they got me saying? Where do they have me going? What do they have me thinking? And most important, what do they have me becoming? Then ask yourself the big question: Is that okay?." Excellent questions. The people around us will always have an influence. The question is what kind of influence? Of course, that question does go both ways, doesn't it? Being around people who are always complaining, talking down about things, and just generally disagreeable has an effect on me. After a time, I start talking like them and even thinking like them, then I am them. I don't really want that though! As a result of wanting more for myself than this, I have stayed away from people who have that disposition. I want to be around uplifting, encouraging and exciting people. It is so much better! It is so much more productive as well. When I first started out in sales at a car dealership at age 22. I used to hang out with the guys and just talk about stuff. It was pretty ugly. I learned to use the f-word in just about every sentence as an adjective, a noun, an expletive, a pronoun, virtually every way possible. Once I realized how ingrained it had become, it was a challenge to get rid of it. Now I say it less in a whole year than I used to in a paragraph. That's how powerful an effect people can have on you and not even see it immediately. You just want to be one of the guys. No problem. Choose the guys wisely. Who do they have me reading? In the past it would have been the newspaper, and sports magazines, but certainly not books and certainly not non-fiction books. Being in sales there would be a great need to read about how to be good at that and get better. I wanted more, so I had to move away and go it alone. What do they have me thinking? Well, you can tell by the last two paragraphs that it wasn't exactly inspiring. It was fun for a while until the jokes got too bold, but I started seeing no value in being in this group. I wanted more. So, the most important question was, "was this okay?" It was not. I wanted more. That is really the key right there: I wanted more. When you want more, you go where you need to go and find new friends, or even go it alone for a time to get there. People absolutely have an effect on us. Who do we want to emulate? If not them, I will be moving on to find those that I do want to emulate. Spread Some Joy Today--Make a list of great questions to periodically ask yourself. Then ask them. Here's a good one to ask your real friends: Have I told you I love you lately? To honor the passing of Jim Rohn on December 5th, 2009, I will be sharing some of my favorite quotes throughout the week. Jim Rohn was a powerful influence in my thinking beginning with my introduction to his teaching in early 1981. See more about Jim Rohn at http://www.jimrohn.com/. "There is no better opportunity to receive more than to be thankful for what you already have. Thanksgiving opens up the windows of opportunity for ideas to flow your way." "Asking is the beginning of receiving. Make sure you don't go to the ocean with a teaspoon. At least take a bucket so the kids won't laugh at you." "One good customer well taken care of could be more valuable than $10,000 worth of advertising." "It is our philosophical set of the sail that determines the course of our lives. To change our current direction, we have to change our philosophy not our circumstances." I am so thankful for Jim Rohn and all that he left for us that will benefit millions for many years to come. He has left a very powerful legacy. "It is our philosophical set of the sail. . ." This quote sums up Jim Rohn as good as any could. He was a philosopher. The interesting thing that I've learned over the years is that it is our thinking that causes and creates. It all starts and ends there. So what he says is so true. It is also the way that change becomes permanent. When you understand what you do and why and what you can do to change and keep the change, it will always be philosophical, or your thinking and consequent beliefs. It is not a means to an end as much as a life long study that gets better with age and accumulation. One of my favorite books by Jim Rohn is Leading An Inspired Life. I can also highly recommend another favorite of mine, The Seasons Of Life. Both are available in softcover for a few bucks. Both of these are so inspiring and uplifting and that is what Jim Rohn does so well. Of all that I have heard from Jim Rohn, one idea stands out above all others. I don't remember what tape set it was, but I'm thinking it was Take Charge of Your Life. He said something like this: "There's two ways to have the tallest building: One is to become known as a builder and the other is to be known as a destroyer by tearing everyone else's building down. You might tear a few down, and then they'll be out on the street saying, 'I've heard of you!'" That thought has really helped me beyond measure to stop messing with other people's lives or how I think they should be and concentrate on being the best I can be. But, it is even better than this. It has really helped me see that there is really no such thing as competition. If there is no competition, there is no need to worry about what others are doing. Another so powerful idea that I have totally accepted is being self-motivated. What if no one shows up is right. That's a big problem. When I accept the challenge myself, I am empowered to live fully. I can't succeed alone. I need other people and other people's ideas, but I cannot wait for them to move me to action, or even to fill me with knowledge or skill. I rely on myself for all of that. Thank goodness. Being grateful is a piece of magic. There is nothing so powerful as gratitude and it costs nothing, yet pays so well. The best thing is how it multiplies and expands without any coaxing. The more it is practiced, the more it expands. There is an unending supply of it to give away and unending joy in return. What a gift for this Christmas day. I Am So Thankful For Every Little Thing! Spread Some Joy Today--See how many times you can show gratitude to someone today. Count all of your blessings and watch them grow! "Disgust and resolve are two of the great emotions that lead to change." "If you don't like where you are, change it! You're not a tree." "One of the reasons many people don't have what they want is neglect. Neglect starts out as an infection and then develops into a disease." "We can no more afford to spend major time on minor things than we can to spend minor time on major things." Jim Rohn was many things in one grand package. Of those many things, one great one is that he wasn't just an encourager and full of wit and wisdom, but he also had a bit of an edge in an attempt to move you from learning more knowledge to moving into action. Sometimes he might say, "you know enough, now is the time to move." The 'disgust and resolve' quote is like that. It's like he's saying, "which would you rather have?" I'll never forget on a tape he was talking about getting going and he said something to the effect of this: "Pick up a rock and drop it on the ground. That is where you start. The next person that comes along, tell him, 'Sir, you're the first person after the rock.' That will get the conversation moving!" Or, he would say, "I can do anything for about 30 days. Work 12-15 hours a day? No problem. For 30 days, I can be endure much to get the goal." One of my all time favorites is him saying that "learning, learning and not doing is not good. That would be like a construction site to build a tall building and then every day you're bringing material to the site. Day after day, you bring more material, but you don't build anything. They'll come and take you away!" "Success is nothing more than a few simple disciplines, practiced every day, while failure is simply a few errors in judgement, repeated every day. It is the accumulative weight of our disciplines and our judgements that leads us to either fortune or failure." Another very famous line was "Discipline weighs ounces, regret weighs tons." And, don't we all know it as being 100% true. Yet another is "don't major in minor things" idea. That makes perfect sense. Why don't they teach this stuff in school? Of course, it's true, we all know it. Yet, at the same time of using such common sense and encouragement to action, he encourages you from where you are right now with things like this: "Success is neither magical nor mysterious. Success is the natural consequence of consistently applying basic fundamentals." Don't we all know that we all have the capacity to do that. A hard working stiff gets that just as readily as a upper level business executive. Thank you, Jim! You take a thing that it is natural for us to make complicated in our head and find a way to simplify it so a child can get it, yet never once talk down to us. That is not easy, yet extremely valuable. I Am Called To Action! I Know I Can. I Will. I Do. Spread Some Joy Today--See everyone you meet today as your mirror. What can you do to see what you want to see? "Leaders must learn to discipline their disappointments. It is not what happens to us, it is what we choose to do about what happens that makes the difference in how our lives turn out." "The challenge of leadership is to be strong, but not rude. Be kind, but not weak. Be bold, but not a bully. Be thoughtful, but not lazy. Be humble, but not timid. Be proud, but not arrogant. Have humor, but without folly." "Learn to help people with more than just their jobs; help them with their lives." You must learn to discipline your disappointments. I have said that so many times and until I found this quote again, I had forgotten where it came from. It is so true. This was a big learning experience to really understand that it isn't what happens but how we think about what happens that makes the difference in how we feel and how we either react or respond. Ultimately, it directs our lives--one way or the other. Jim was such a powerful leader and I think it is better said that he was a "world mentor." I considered him my first real strong mentor and I studied what he had to say. Sure he was a leader, but a mentor is so much more to me. I think of a leader as the President of the United States or some company, but I think of a mentor as someone much more personal to you though you may never have met in person. I forget the human part of them and consider the message as transcending all of that because it is so useful to me in becoming more, living more and loving more. Jim's quote on the challenge of leadership is so good. I have met so many so-called leaders in my past that could not be classified here. I will have to call them 'managers' instead of leaders. Leaders are all these qualities: strong, not rude; kind not weak; bold, not a bully; thoughtful and not lazy; humble, yet not timid; proud, not arrogant and have humor without folly. It doesn't come from a magnetic personality but from experience, dedication and constant learning. The last quote is something I have tried to do well since I first became a manager at 25 years of age--to help people with their lives not just their job. I've never been just an employer, but a friend. It isn't a personal thing so much as being an encourager and uplifter. I try to inspire as I am inspired. To me, there is nothing so special and so welcome as words of encouragement, whether verbally or in writing. I know how special it feels to me, so I want to give that same feeling back to everyone I can. It is far more valuable than money and lasts forever. I can remember encouraging words way back and I endeavor to forget and erase any and all discouraging mentions. "The most important question to ask on the job is not "What am I getting?" The most important question to ask is "What am I becoming?" I want to help people become more, because that is what I want for myself. Let's call it the Golden Rule of leadership: Lead others the way you want to be led. Leadership Is An Art. Jim Rohn Is A Masterpiece! Spread Some Joy Today--Begin becoming an encourager: Start encouraging someone this very day. "The greatest gift you can give to somebody is your own personal development. I used to say, "If you will take care of me, I will take care of you." Now I say, "I will take care of me for you, if you will take care of you for me." "Happiness is not an accident. Nor is it something you wish for. Happiness is something you design." while you pursue all that you want." These three quotes are all so much a part of my life now and at one time I thought very differently. Personal development is so critical in my life that I find it hard to imagine not studying it well and thoroughly. It is logical: the more I am, the more I have to share. It's also personal responsibility in making the decision and moving down that path. It's also deductive reasoning: I can't change anyone except myself. Let me tell you that this was the hardest lesson I have ever learned and it took me a very long time to really accept it fully. Not that it was hard, but my resistance was like granite! Then I've found that happiness is not something that is really attached to anything. It is not an exterior event, but an internal design. If it were accidental, it would be a really tough world. Fortunately, it is as easy as choosing it moment by moment and any moment will do just fine. Then, expand it by designing more ways to enjoy it. Learning to be happy with what I have in pursuit of what I want has been a tough one to accept as well. The reason it was tough was because I used to always focus on what was wrong and how to change it; what was missing and try to find it, and last a general association that more things equals more success, which equals more comfort, which equals more happiness. What is interesting now is that I am in the pursuit of more than I have ever even dreamed of before, but the big difference is that I am completely happy with what I have now, where I am now and who I am now. The pursuit is not a need, but a desire. There is a world of difference. "We can have more than we've got because we can become more than we are." I Can Become More . . . And I Am! Spread Some Joy Today--If you get a chance, get a copy of Jim Rohn's Challenge To Succeed tape sets. You can get it new on Amazon or many other places including www.jimrohn.com. It is an awesome teaching and among his most popular. "It isn't what the book costs; it's what it will cost if you don't read it." "Most homes valued at over $750,000 have a library. That should tell us something." My real learning began by reading books starting at age 22. When I was first heard a Jim Rohn tape at age 30, he kicked that desire for knowledge up dramatically. His words from tapes and his books are with me today so much that he is a part of me. My actions on those words haven't always been focused, but his wisdom and guidance remain faithful. The rest has always been up to me. One of the powerful things Jim taught me was to read well, create my own library and to be self-eductated. This I have done. Prior to starting a book business in 2004, I had about 2,000 books in my personal library (I recommend you don't move very often. . .). Adding the cost of that is a sizeable number; however, they were acquired over a long period of time, and besides, the value is hundreds of times the cost anyway! Share them. I have given away several hundred over the years to special people I wanted to encourage. What goes around, comes around. I've been blessed, so I pass it on in many ways. If you haven't already, I encourage you to build a great library of books that move you and instruct you and inspire you. 100 would be a good number. 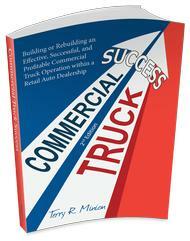 I have a partial list to get you started on our blog: http://commercialtrucksuccess.blogspot.com on the right side. I Don't Need A Library Card. I Have My Own Library! Spread Some Joy Today--Share a great book with someone. It will be a great joy for you afterward. A cheap thrill and a lasting benefit. Way cool. "You can be either a hunter or a fisher. In terms of influence, most people try to hunt. They're going to come at you, they're going to influence, they're going to persuade. What does an animal do when it's being hunted? It runs! Many salespeople say, 'I just can't close the deal.' Stop hunting! What happens when you fish? You put out attractive bait, and then the animal comes to you." Isn't this like dating? Or job hunting? Spread Some Joy Today--Try this different approach this week and see what results you might achieve. Isn't that so much better than this: "Go to school, get good grades, mind your elders, get a good job, work hard, get married, have a family, plan for retirement, retire." A larger purpose makes all the difference, doesn't it? I Choose A Larger Purpose! Spread Some Joy Today--Think of all the exciting things you can do to help someone else. Ain't it fun? Now do some of it today! "Act as if what you do makes a difference. . . it does." It's easy for us to think what we do is just a job and that it isn't important. If you have ever felt that way, go out and rent the Australian movie, Kenny, starring Shane Jacobson. Kenny is a guy who delivers and cleans portable toilets for a living and he is quite good at it and really takes pride in his work. It is funny and heartwarming and educational. Great movie. Whatever you do, it probably isn't nearly so challenging as what Kenny does. He really makes you feel that he gives 100% every day, regular or overtime, rain or shine, through challenging days and easier days. What a different world it would be if everyone gave the service with the great attitude that Kenny has. What Kenny does for a living makes a difference. If you're at an event needing a toilet and wanting it to be clean and ready, it makes a huge difference. What you do makes a difference and how well you do it makes a huge difference. Maybe you sell cars for a living. That is a worthy task and in my experience, that job has a lot of levels of expertise and knowledge. Let's say you went out to buy a car and you weren't exactly sure what vehicle you wanted and you go to the car lot. How would you like to be treated? What kind of sales person would you love to get? How good of a car sales person you are will matter a great deal to the potential customer and if won over and taken good care of, that could lead to a very long and profitable relationship. Maybe you work in an office doing something with papers and computers. All we have to do is picture all that being done extremely poorly and we can imagine that having talent at doing these things matters. Frankly, I dislike filing and consequently, my desk is a disaster. I need someone who excels in this area! Whatever you do, there is obviously a need for it or you wouldn't be doing it. That means that you make a difference! And, if you happen to have a great attitude and do what you do well, you make a heck of a difference. Thank you for what you do and how well you do it! Spread Some Joy Today--Give yourself a little private reward today for making such a difference in what you do. You're special, and it's time to appreciate that more. Have a private party! Thank you! "The better a man is, the more mistakes he will make, for the more new things he will try. I would never promote to a top-level job a man who was not making mistakes. . . otherwise he is sure to be mediocre." I've made a lot of mistakes over the years, but I rarely worry about them. I feel like it is best to give it your best shot with the best intentions and then learn from that experience however it turns out. The good news is that I have made a lot of successes as well. Indeed, some of the so-called failures were movements toward eventual success. Then, who is the judge of the failure or success? They say that a spaceship fails its way to the moon with many mid-course corrections and in those, it succeeds on hitting the target. Without those little 'failures,' it would not arrive at the destination. That's a fair way to look at our own lives and actions, don't you think? We can 'fail' our way all the way through life as long as we learn from the experience and we have a destination in mind. This might give a whole new definition of succeeding. So, the morale of this story: Get out there and make some mistakes! Give it your best shot. Learn from the data. Keep on keeping on. It's all good! Here's to your success at failing! I Fail, Yet I Succeed! Kind Of Like Babe Ruth! Spread Some Joy Today--Is there something you've been holding off doing for fear of not getting it right? Today is a good day. Go for it! There is abundance all around us and most of us focus on the lack instead. We are so easy to see what is missing, rather than what is there. It is only after we 'tune into' abundance being there that we begin to see it and have it enter our lives in a way that has never been before. There is an abundance of air to breathe. There is not only an abundance for you, there is enough for over 4 billion and counting. If we get it dirty, we can clean it, but it is there and we are breathing it and there is an abundance--virtually an unending supply of it and it is constantly being made. There is an abundance of opportunity. There is opportunity all around us and until we open ourselves to that possibility, we believe in the lack of opportunity. Change your thoughts about that and opportunity is virtually everywhere in unlimited supply. There is an abundance of water, sand and soil. That is, after all, the surface of this entire planet. We could never get around to using it all. There is an abundance of love. You have an infinite supply available to you. It will never run out. You can choose to withhold it, but the source is unlimited. The same would be true of hate. It is a choice. There is an abundance of ideas. Just when you think that everything that can be invented has already been, there are millions of them waiting outside for you to open the door and let them in. Kind thoughts. Uplifting thoughts. Encouraging thoughts and words. There is an abundance of these available for immediate use. You don't need to stand in line and wait your turn, just push the button and there they are. Truth is, there is abundance everywhere and all we need do is think that is true and it is. As the eyes are opened, they can see and there is an abundance to see. Spread Some Joy Today--Since you have so much, why not give some away today. It will be replaced in an instant. How cool is that? but he isn't a failure until he begins to blame somebody else." Blame is justification, isn't it? Whether we blame a person or a situation or an event is all the same. I've been a failure several times in my past, but I have rewritten history now and I am not a failure, though I have failed many times. The difference is who I pin it on. I used to pin it on the economy, the lack of capital, the conservative lenders, the list goes on and on. Now that history is rewritten, I don't blame anyone or anything in particular. It is just what happened. The key to that is to learn from what happened to see if there is anything worth learning and benefiting from. The key to that is that there is always something to learn and there is always a benefit. Once we get to this point in our enlightenment, there are no failures at all. Each event is purely a learning experience. Doesn't that make sense? Based on that, there is nothing but success! I Am A Success! I Learn Continually. Spread Some Joy Today--It might be time to rewrite some of your history. You didn't know you could do it before, but now you know. Write it so it suits you! it is what you are continuing to do with what you've got." I've studied a number of extremely successful people. They all accomplished many good things and made a lot of money. The difference that stands out to me is what they did or didn't do when they stopped doing what they did that made them successful. Some made bad investments and lost everything, some retired to an easy life and died shortly after, some kept on creating, giving and living. As an example, William C Durant, the founder of General Motors and Chevrolet who was rich and famous, lived on a small pension in later life and managed a bowling alley before he died. Another example was Andrew Carnegie, who sold his business in 1901 at age 66 and went on to create a system of public libraries throughout the country that were commonly called Carnegie Libraries--over 3,000 of them! One gave up and the other shifted gears. It wasn't a matter of money, it was a matter of spirit, attitude and purpose. On a more personal scale, I think it is incredibly beneficial to continue to grow and seek and change and expand--not just in knowledge and experience, but in gratitude and generosity. It seems like sometimes life is a lot of working on getting, whether it is knowledge in school, experience in work, money from employment and that a fully successful life would include that, and also include giving much, if not all of that back. This was Andrew Carnegie. He did both getting and giving back exceedingly well. William C Durant was good at getting while times were good. He never got around to giving back. Even if I amassed a pittance in comparison to Andrew Carnegie, I have so much I can give back from other attributes that I have gathered. Isn't that just as true with you? We can start giving it back now. There's no need to wait. I think getting and giving go together so well that there need be no separation between them. It is all part of the same experience by just opening ourselves to that possibility. Ain't it grand how great our capacity is? It is endless! Grow Baby Grow! There Is So Much Living To Do! There Is So Much Giving To Do! Spread Some Joy Today--While you're getting what you want to get, what can you give today that will make a difference? It is as easy as a smile, as thoughtful as a kind word, and as profound as a voice of encouragement. Sounds like a vacation in Tahiti. . . or a real life Fantasy Island. Henry was a thinker, and a great one. I Choose To Live Life Boldly! Spread Some Joy Today--See how many times you can think of something that causes you to smile or laugh. Way cool. has no advantage over the man who cannot read them." This was me until age 22. How did I get through school? It hasn't stopped since. Spread Some Joy Today--Go buy a book you've been meaning to read. Here's a suggestion: Think and Grow Rich by Napoleon Hill. "If you had a friend who talked to you like you sometimes talk to yourself, would you continue to hang around with that person?" Isn't this a great question! I've always wondered where that negative talk comes from. Maybe you have experienced this as well. I can't find something and the first thoughts in my head are that someone moved it, took it, discarded it, or otherwise made it become missing. I search my memory for the culprits. Then, I remember, I put it in the drawer so I could find it. It reminds me of the "I didn't do it" syndrome from childhood and I'm still looking for someone to pin it on. Many times I've thought of what instantly was a great idea in my mind, only to have the conversation in my head questioning my ability, my finances, my intelligence, how others will perceive it, the risks and on and on tearing it apart shred by shred. Trouble is that it has operated automatically this way all my life until late and I've found out who the culprit really is: The Ego. In Dr. Wayne W Dyer's book, The Power of Intention, Dr. Dyer talks of Ego being made of six primary ingredients that account for how we experience ourselves. The top three are these: 1. I am what I have. My possessions (or lack of them) define me. 2. I am what I do. My achievements (or lack of them) define me. and 3. I am what others think of me. My reputation defines me. The phrases in parenthesis are mine. Until I read that, I didn't really think about the Ego much, but that really had it make better sense to me; sort of an ah-ha experience. Now, when I hear that voice in my head trying to talk me out of something or put me back in my place, I see what the Ego is trying to do. It is trying to protect me and keep me safe from harm. Trouble is, it is making that decision much of the time without my permission. I've just let it have control when I really didn't think that through. Now, I say, "thank you! I know you mean well, but I will take it from here this time." I have to say that the Ego is persistent in its efforts to keep me from harm. You gotta appreciate that kind of care. But, I'm either in charge or it is, and though I appreciate its efforts, I know this opportunity is right for me and I am going ahead even at the disapproval of my Ego. This has all been so helpful for me and gets easier every day. I hope your Ego was better trained at letting you be in charge. You probably had nice parents who encouraged you and loved you and guided you. You probably lived in a nice neighborhood and rode in nice cars and got taken and picked up at school and didn't have to ride the bus. And you went to college and. . .
Oops. Sorry. That wasn't your Ego at all, was it? Go create your world! Nobody deserves it more than you! My Ego Serves Me. Not The Other Way Around. Spread Some Joy Today--Listen to that self-talk today and take over for the well intentioned, but misdirected Ego and do it so it serves you well. "We are not retreating--we are advancing in another direction." This is a great quote regardless of how you might feel about Douglas MacArthur because it demonstrates a different outlook on what most would call defeat or failure. It's a very good one! I'm just a few pages from finishing rereading Failing Foreword - Turning Mistakes Into Stepping Stones For Success by John C Maxwell. If life has been a little challenge of late, the first few chapters of this book should help to give you some renewal in your spirit. John Maxwell says, "The difference between average people and achieving people is their perception of and response to failure." In his book John tells stories of many well known people and the mistakes that it seemed that they made, and each one of them makes it clear that it wasn't so much a mistake as an activity that didn't produce the results they imagined, and yet, it was really a stepping stone toward their objective though that was not necessarily clear to them at the time. It has been said that everyone has 20/20 hindsight because you can see the whole path from here to there. That's really kind of a good way to look at it. Pretend that you're looking at a Google map, maybe a satellite map and as you zoom out, you can see from here to there really well. Pretty soon, as you continue to zoom out, you can see where everything leads and where everything is in relation to one another. When you zoom back in all the way, you can only see what is in front of you. Next time something happens and you think it is a mistake or a failure, try zooming out in your mind and see if you can see a different picture. For example, I've lost jobs in the past and it was the best thing that could have happened to me for a list of reasons, yet at the time, it seemed so terrible. As I zoom out and look back and around, I can see that it was a stepping stone to where I am and what I have become. And today is the same. I am on a path of stepping stones from one place to another. As I am able to zoom out enough to see more of my path, I am satisfied and excited and appreciative of where I am at the moment. It is that power to be okay with where you are that helps make where you are going next so much better. I am not failing. I am succeeding in another direction! I Am Enjoying My Journey! I Can't Wait To See What Will Come Next. Spread Some Joy Today--Try zooming out on some of your past experiences and see if you can see how great it all worked out. Try it on some happening now. and there is nothing you have to do." My goodness! There is such power in that statement. There is freedom in that statement. There is peace in that statement. I think it is worth writing out of a banner and putting on our office walls, but phrase it in the present tense, like so: "I choose everything I do. There is nothing I have to do." It is incredibly empowering to learn how to think this way. To take away all the silly little things that we make up about why we do things will be a huge blessing. Even the simple, everyday events will change color. For example, rather than saying, "I have to go to work today," say instead, "I choose to go to work today." What a difference between those two statements. It is like night and day. How about, "I hate paying so much in taxes." Change that to, "I choose to pay these taxes and be grateful for the benefits I receive throughout the year." You could even have some serious fun with this change in thinking, by kicking it up several notches, to, "I love paying these taxes. I love all the benefits that I receive that I only pay a tiny fraction of and I get the full benefit of!" Yo! It might change your life! How about this: "I love getting up early and I am choosing to have one of the best days of my life today. I don't know why really, but I just feel it in my bones this morning. I am going to rock out and feel the music today!" So much better than, "man, I hate going to work. I can't wait until I can retire and be done with all that. I just want to kick back and take it easy. I've been working all my life and I'm ready to relax." Some people are really dead, but just haven't fallen over yet. How about some living! Some enthusiasm! Some fun! Lots of Joy! It's all good. I don't want to get you too excited. You might start a new Facebook or Wal Mart or something. Be rich and famous and drive a car that cost what you earned in your previous entire life. Be cool. It's okay. You go on and mellow out and get ready for retirement. Gotta supplement that Social Security you know. Sixty-Five and all that. Are you crazy??? No way!! Let's rock on right through the end! With gusto and bravado and silliness and excitement. Dang. Ain't it exciting that you get to choose?? So cool. I Decide. I Am In Charge. The Buck Starts Here! Spread Some Joy Today--Totally feel the excitement of having 100% power of decision in everything you do. It's a responsibility you've been waiting for! I hear a lot of people that are discouraged about a lot of things. What good comes of that? Is there a requirement to feel discouraged when things are not going your way? Is there some kind of benefit to feeling crappy? Is it going to change anything having this feeling? Will the answers to change it suddenly appear after feeling it for a while? No. It's all downhill into more and more crappy feelings, like frustration, disappointment, anger, despair, depression. None of those are any good at all. On the other hand, what do feelings of optimism, excitement, enthusiasm, cheerfulness, joy and confidence create? Feeling great, empowered and in control. What good comes of this? Everything! Is there a requirement to feel joy when things are not going your way? If there were, life would be a joy! Is there some kind of benefit to feeling great? Absolutely! Is it going to change anything to have these feelings? Absolutely! Will the answers to change things come? Absolutely. So, the answer is very clear. Feeling good is the way to go and the way through. Is the next question, how do I have that feeling when things are not the way I want them? Here's the key: Practice. Yes. Try it, do it, do it again, do it again and again and again and again. At first you need to use your memory to go back to a place where you felt great and hold that thought and feel it and spend some time in it. After a lot of practice, you just change your thought and you're done. Lucille Ball learned the hard way. I suppose that we all have, but many of us have never decided to move away from it. That is the first step. You do have the power and you can do it. You must choose it. Focus on how you want things to be and then live there in that fantasy as much as you can. Your mind works on pictures and will go to work to make that picture happen. If someone tells you that you're denying reality and living in a fantasy world, tell them, "Absolutely!" Next time, don't tell anyone and keep what you're doing to yourself. If they want to know why you feel so good, tell them, "I just felt like feeling good, so I did." It's okay to keep people curious. Worst case scenario is you will feel great when others are feeling crappy. How bad can that be? Best case scenario, you will arrive in your fantasy for real! What kind of self-confidence do you have now? I Will Choose To Feel Good--Because I Can. Spread Some Joy Today--Feel yourself feeling like a million bucks! It's better than money. Money doesn't bring happiness. You choose happiness. It's FREE!!! "Watch your manner of speech if you wish to develop a peaceful state of mind. Start each day by affirming peaceful, contented and happy attitudes and your days will tend to be pleasant and successful." Many people think they know, but really do not understand what affirmations are. When I'm complaining about anything for whatever reason, that is an affirmation. If I say, "this is going to be a 12-hour day and I'm running low on energy and I'll be dragging by the time it's over," that is an affirmation. If I say, "I feel great today and I am looking forward to each and every experience I find today," that is an affirmation. Which do you think brings results? Both. Indeed, they will bring different results, but results nonetheless. The question is, which results do we want? To be tired and frustrated, or excited and optimistic? They are equally in our power. I just told my business partner this afternoon that "things are not what we want right now, but the interesting thing is that I am awash with optimism! I am absolutely excited about what is yet to come!" He agreed that he had the same thoughts. We get to choose how we are going to feel and we can have bombs going off all around us and choose to look forward with optimism. When people ask me, "how are you?" I always say something like, "awesome!" or "I'm over the edge with excitement!" Words have a lot of power and choosing the ones that empower you rather than disempower you is worth the effort. I absolutely love Anthony Robbins book, Awaken the Giant Within. In that book, he has a list of empowering and disempowering words and phrases. Each have a tendency to achieve a different feeling or attitude. For example, rather than saying, "I'm pissed at so and so for doing that!," instead you could say, "I'm a little bit tinkled about that person's choice of actions." Pissed and tinkled have a completely different sound and feel. I'm choosing tinkled because it serves me better. Being pissed doesn't serve me, it distracts me. Tony has several pages of word and phrase transformations on pages 226-231 of his book, such as changing from disgusted to surprised, or overwhelmed to maximized, or anxious to expectant, or terrible to different. Then he suggests we even pump up the positive words and phrases like from comfortable to smashing, energized to turbo-charged, good to vibrant, pretty good to coolamundo, strong to invincible. These small changes are extremely powerful. Words, words, just a bunch of words. What does it matter? What we say to ourselves matters so much because it molds us into who we are. Look around you at someone you know who is an angry person. Listen to the words and phrases they use. It is really clear where they are and who they are. Maybe you also know someone who is generally happy and upbeat. Listen to the words and phrases they speak. I'm sure there is a dramatic difference. Choosing different words and phrases will be hard at first, but with practice it will be a good deal of fun. Begin today. Pay attention to what you say and how you feel. Start by finding some different words and try them out. I think you'll be amazed how much of a change it will create in you. I only know that because of what it did for me. I Will Pay Attention To What I Say Aloud. Spread Some Joy Today--Share some of your new found responses with others today! Watch their faces. Feel the fun of it. Feel yourself feeling good! It is a selfish world after all . . . I Will Become A World Changer, One Day At A Time. Spread Some Joy Today--Try a little kindness. Strike that. Share a LOT of kindness today. It is such an easy thing and so rewarding. climb over them, or build with them." Oh, the choices. . . I Will Become A Builder. Spread Some Joy Today--Being on Facebook is one way to build. If you don't Facebook already, now is a great time to try it. "You have your way. I have my way. and the only way, it does not exist." This is the first time I've seen this exact quote; however, I learned this message many years ago. I have stated many times, 'There is no right way or wrong way, there is my way, your way and their way.' This phrase has helped me immensely over the years to put things into perspective. Every time someone tries to tell me that there is only one way to do a thing, I remember this phrase. Any time someone uses the word 'should,' I think of it again. The truth is that there is no right or wrong way. Those are purely judgments by the person stating it is right or using the word should. It is their belief (assuming they state it with conviction). Almost all of Europe thought the world was flat at one time, so that is an indication of how beliefs can ebb and flow. I truly believe that there is no right way or wrong way, but a way. As a result of this, I find that the word 'could' to be much more appropriate in making 'suggestions' to people about things they 'might consider' in case they are looking to change their results. If I state it any other way, it is my ego chiming in. Don't we all know by now that the only way to convince anyone of anything is to speak in a way that allows them to convince themselves? Any other way will likely be unproductive. I love suggestions and a bit of time, then I allow it in. I thought it was my way. . . I Will Listen To Your Way and Their Way, And In The End, I Will Do It My Way. Spread Some Joy Today--Let other people have their way today. Just coast for one day and let everyone have their way. to admit that there is something wrong with it." to focus on and constantly expand on what's right about it!" Sorry Norman, I know you mean well and you have far more education than I; however, I have to disagree completely with this quote. Frankly, it is a piece of cake to admit there are things wrong with a company, or a person, or a situation, or life, or the world, or whatever. It takes no brains at all to do that. Line 10 employees up and ask them what is wrong and you will get a serious earful. If they feel free to talk, that is. And if they do, look out! Here comes the judge. . .
What is really needed to move a company forward (or a person, situation, life, the world, or whatever), is focusing on what is right and constantly expanding on that. Who cares what is wrong? Focus on what you do well and expand on that. I tell you this from long experience: naysayers are a dime a dozen. You can find them anywhere anytime and any quantity. And, I'll tell you this from experience: they don't do anything to help anything. They are anchors and sinkers and balloon poppers. My best advice is to move quickly away. Here's a great question to ask all the employees: What are we doing well? Then, some follow-up questions, like, How can we do more of that? How can we expand that? What do you hear our customers say that is good about us? Can we give better service? How? How can we give such great service that our customers will rave about us? How can we lower prices and still provide more value? How can our company be a better participant in the community? How can our company have employees to rave about working here? What's even better than this is to ask your customers and prospects: What is your experience like with us? What do you like about what we do? What do you think we could add to make it better? For you to tell all your friends about this company, what would we need to be doing to have you that excited about doing business with us? Focus on successes not failures. Leave the failures for history to sort out. Get the enthusiasm rolling and the excitement arcing and the fun laughing. Turn it on and watch it glow. It just needs a spark and some insight and ideas. Let's rock it out! I Focus On What I Am Good At And Get Better. Spread Some Joy Today--There is almost nothing better than giving someone else some encouragement. Find something to encourage someone else and don't keep it to yourself--TELL THEM--NOW! To their face is okay. . .
"Feelings are much like waves. but we can choose which ones to surf." In the early 1970's, I studied T/A (Transactional Analysis), a self-help method of understanding psychology. It hit the public with the launch of a book, Games People Play, by Eric Berne, MD and was followed by another very popular book titled, I'm OK, You're OK, by Thomas A Harris, MD. The first one was copyrighted in 1964 and the second book in 1967. It is interesting that these books are still available new today on Amazon.com and elsewhere. I was certainly not alone in finding them extremely helpful and instructional, as I still believe they are equally today. One of the things I learned that has never left me is to "own my own feelings." The premise is that no one can 'make' you feel anything, but that you 'make' yourself feel. There is a great deal of truth in this. I have used this for myself for almost 40 years, and I use it all the time. Whenever I feel something, I pretty much automatically now think that I need to own that feeling and not blame it on someone else. This helps me to understand what is really going on instead of reacting to others. I'm not a robot, it is a constant work in progress, and I get better at it all the time. So, here's the deal: I can 'feel' the emotion, but I don't have to 'feel' the pain if that makes sense. This is why I love this quote above so much because I can feel the feeling so that I'm not like a stone, but I can choose which feelings I want to 'surf,' or plug into or explore. In other words, I don't have to agree with someone who may be saying something to me. I can choose a different thought about that. Sally Field said it this way: "It took me a long time not to judge myself through someone else's eyes." Taking charge of which emotions to surf is critical in an entertainers life for sure but just as important on our own. People only have the power that you elect to give them based on what you think of yourself. Frankly, it is a wonderful thing to realize this and take charge of it and control it myself. Even if something someone says that I don't like rubs off on me and I feel little crappy for a while, it will be a very short while until I realize what I've done and then turn it back around and be back in charge of my own emotions. Believing in yourself, your value, your worth is awesome and you will be rewarded with an uncrushable self-image. That kind of self-image is unstoppable! I Choose My Emotions. I Do Not Allow Others To Choose Them For Me. I Am In Charge Of Me. Spread Some Joy Today--Today I Want You To Choose Happy Thoughts About Yourself All Day. Have A Lot Of Them On Purpose. Smile As They Pass By. Feel The Joy Inside. You Are Awesome! You Are Exceptional! You Are Wonderful! ". . . there is nothing either good or bad, but thinking makes it so." Judgement. It is a tough thing to give up. We're so used to it and many of us use it so often, even many times in every day. It becomes our own righteousness that we defend for judging others as wrong automatically makes us right. We think. Or does it? My experience is that this quote doesn't really affect Christians very much. It's like it is meant for something other than every day life. Again, we're so used to judging, that it is so darn hard to let it go. But that is what it takes: letting it go. I'll give you a challenge: for the next week, do not label anything bad or wrong, no matter what it is. You can acknowledge that it is, but not that it is bad. It's not bad weather, it is the weather. It's not bad news, it is the news. It's not a bad situation, it is what it is. They didn't do it wrong, they did it. If you can give up labeling things bad, or wrong, you're halfway to paradise. It doesn't matter if the things are big or little, the key is not judging them as bad or wrong. It is probably counter to everything you learned growing up--I know it was for me. The list of bad and wrong things was very long and constant to the point there was so little right in the world. Big Brother, Uncle Sam, the Republicans, the Democrats, the Unions, the Corporations, the Wealthy Aristocrats, Taxes (on many levels), Prices, Wages, Global Warming, Receding Hairlines, Yellow Teeth, Scratchy Toilet Paper, and as you can see, this list could go on indefinitely. I am willing to bet, that if you can really do it for a week, you will find yourself feeling better about all kinds of things and I am sure that then you could make it two weeks, a month, a year and the rest of your life. Of course I am speaking for myself since I am a recent convert. You're probably way ahead of me praising everything. . . Rock On! I Am What I Am. It Is What It Is. Deal With It. Spread Some Joy Today--If a co-worker starts down Negative Lane, or Wrong Avenue, encourage them to Peaceful Place. You have more power than you think.